This is going to be one of the toughest reviews I have ever had to write, sometimes you read a book and you just pray that your words can do the book justice and convey just how epic the story you just read was and this is one of those instances. It is no secret I am a huge fan of Amy Harmon, her words have always touched me on a deep, emotional level and her writing style never fails to capture my attention from the very beginning, however, I am not a huge fantasy reader. In fact, only one author has managed to capture my attention in fantasy land and that is Amy Bartol, it must be the “Amy” effect. To say I was slightly hesitant to read this would be an understatement, I was worried that my lack of fantasy reading would hinder my enjoyment and a genre that I can’t seem to gel with would break my run of Amy Harmon greats, I needn’t have worried. I can say hand on heart Amy Harmon nailed this genre, her trademark writing style was present throughout with visceral scene setting that totally enveloped me in the Land of Jeru and all its inhabitants. To bring another world to life with such clarity and vivid imagery is an extremely hard feat and not many can pull it off so it is relatable and believable, but I was firmly captivated and totally under Amy Harmon’s spell, she definitely has a gift herself. BUT and this is a huge BUT, this is not just a fantasy read, interwoven between battles for supremacy, greed and power is a beautiful love story that will have your heart beating a mile a minute as these two battle the odds to beat their foes, save their country and ultimately conquer the evil forces that are resolute in destroying everything and everyone. This book was classic Amy Harmon, her signature themes are hidden masterfully as you read between the lines and really unearth the hidden messages within expertly composed prose that will definitely affect you on every level by the last word. Everyone is gifted in their own right, we all have something that we can do better than anything else, the trick is to whether you use it or abuse it. 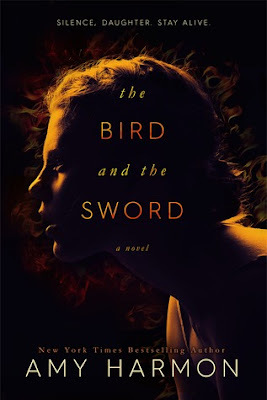 Amy Harmon definitely used her gift with The Bird and the Sword. Tiras and Lark will capture your heart and soul in The Bird and the Sword, two people that are “broken” in their own way but together make a formidable adversary. Two people who connected in the direst of circumstances, yet saw the beauty within and definitely made the most of the hand that they had been dealt. Two people who had the hugest hearts, the purest of souls and courage in their convictions. Two people that were far from followers but two people who followed their gut, exorcised their demons and most importantly supported and loved one another. Amy Harmon delivers a beautiful, exquisite story of good versus evil, where you will be questioning everyone’s integrity, morals and scruples. An ever present layer of suspense interwoven with a breath-taking romance that will capture the hardest of hearts. Beautiful, stunning, amazing, captivating, flawless…there are not enough superlatives. Even if you are not a fantasy reader I beg you try this one, this is all about the story and it would be a shame to miss its epicness because of a blanket opinion of the genre…it was just simply…stunning.